Tax-Aid helps families and individuals who earn less than $55,000 per year. The average household income of the people we help is much lower than that — most earn less than $22,000 per year. The tax refund is frequently the largest paycheck the family will receive all year. Taxes are complicated and people with low income can have complex tax situations. Though there is free tax software, some people lack reliable internet access or the digital literacy to prepare their own tax return. They are afraid of making a mistake and ending up receiving a scary and confusing letter from the IRS written exclusively in English. If they go to a paid preparer for help, the average tax return costs $300 and may cost much more than that. The tax refund is frequently the largest paycheck the family will receive all year. 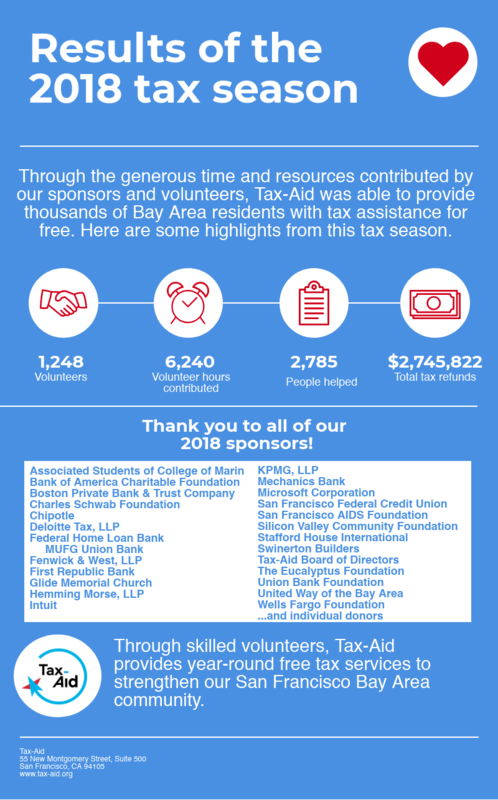 Tax-Aid expert volunteers are eager to help and make sure families receive the full tax refunds and credits they have earned. Due to limited free options after April 15th, people often have to drive hours and miss work to get free help. Our year-round program, Tax-Aid 365, helps people with their tax issues virtually by leveraging communication technology saving people precious time and money otherwise spent on transportation.